Mould and paint your own dinosaurs is a craft kit from 4m. This kit comes with everything you need to make 12 plaster dinosaurs with magnets and pins to turn them into badges and fridge magnets. Mix up the plaster and pour into the dinosaur moulds. Once the plaster is dry they are ready to be painted and coated in glow in the dark paint. Blake was given this kit for Christmas and he couldn't wait to get started but was a good boy and didn't open it up until we had time to do it together. Blake is only 4 and this kit is recommended for children over 5 so a little bit of my help would be needed. The plaster is in two separate sealed bags, using one bag fills all the dinosaur moulds so they other bag can be kept for later without creating a mess. I put the correct amount of water into a measuring jug for Blake and then he added this to the plaster and stirred it up. It says n ot to over stir the plaster so I grabbed it off before too long and we poured it into the moulds. I wiped around the edges and tried to poke out any air bubbles as best I could. Then we waited a little while before inserting the badge pins and then leaving them to completely dry. By the time we had lunch (about 30 mins) they were dry enough to paint. When turning the dinosaurs out of the mould the neck on the long necked one broke and there were a few with air bubble marks. How well the dinosaurs are painted will really depend on the age and ability of the c hild. Blake did the main colours and I put on the details. You only get 6 coloured paints with the kit which are quite bright but Blake discovered you could make some better dinosaur colours by mixing them together. We left them to dry again which didn't take long. We then tried to put on a magnet which has a sticky back but this wouldn't stick so we had to use some glue. Blake had lost interest at this point so we never got round to using the glow in the dark paint before the dinosaurs were taken to be played with. Maybe this glow in the dark paint will be used on some snails in the style of the Outnumbered TV programme. As you can see in the pictures some rough play has resulted in a little damage but they are still in one piece. - Quick drying plaster and paint. - Badge pin dries in to the plaster without the need of glue. - Suitable for a wide age range. - Creates a little washing up. - Magnet didn't stick on. - Air bubbles cause the dinosaur mould to not fill entirely. How Much Is It? 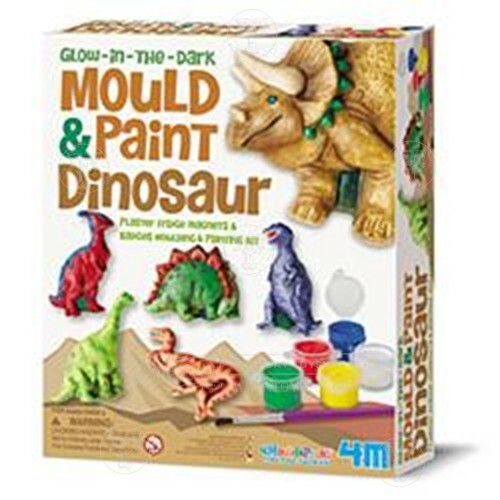 - Mould and Paint Dinosaurs Kit is available from www.toyday.co.uk and cost £9.99, this offers good value for money as the moulds could be used again if you purchase more plaster.